[UA Jaguar 2014 07-04 aa.jpg] Male jaguar photographed by automatic wildlife cameras in the Santa Rita Mountains on July 4, 2014, as part of a U.S. 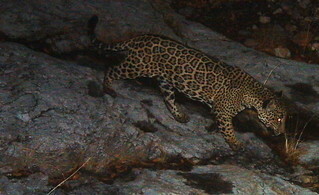 Fish and Wildlife Service/Department of Homeland Security-funded jaguar survey conducted by University of Arizona. This is the same jaguar that has been repeatedly photographed in the Santa Rita Mountains.